Hello and welcome to this tutorial. 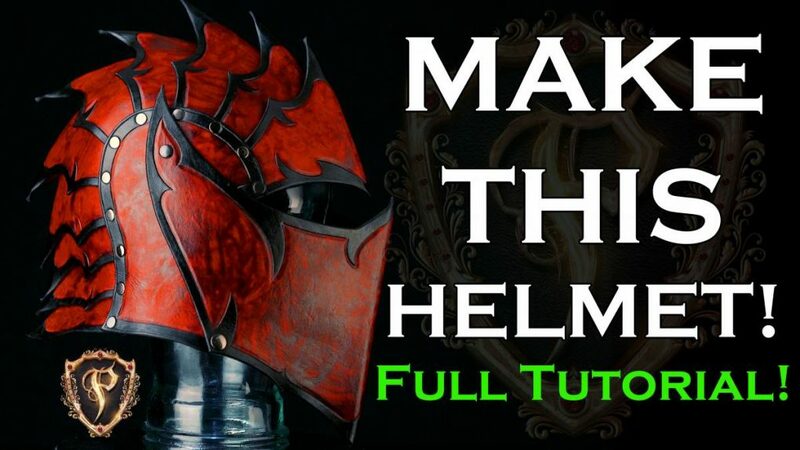 I’m going to be taking you through every step you’ll need to craft this fantasy helmet from leather. I’ll be making this pattern available with two variants. And you can always use the tips and techniques I show you in this video for other leather projects or to help you come up with your own design. I want these tutorials to help as many people as possible. So I’ll do my best to cover a lot of the basics throughout the process. But if anything seems too complex in this tutorial, don’t worry. I’ll be making a whole series of general videos covering everything from the basics of leather working all the way to more advanced armor designs. I would like to start by thanking Tandy Leather for sponsoring this video. Their support has allowed me to invest additional time to create this tutorial along with new designs just for this video. They supplied the materials needed to craft this project. And any tools and leather you will need can readily be attained with a trip to your nearest Tandy. Or you can use my affiliate link below, an even more convenient link. Order anything straight from their website. Getting started. There will be a separate quick start video for this pattern with additional tips, design, fit options, how to print, and more. So if you’re following along with the patterns, first check that before proceeding. I’ll talk about some of the tools I’m using throughout the video, but I’ll also provide links and product numbers for all of the tools you’ll see in this tutorial. Ready to dive in? Alright. Let’s go. I printed these patterns on typical 8.5 by 11 printer paper. And it works well enough, but it’s worth noting that you can purchase some heavier weight printer paper or even get some tag board or poster board and use one of those school glue sticks to reinforce the patterns for using your tracing. Cutting the patterns. When you have the patterns printed, just carefully cut along the line. If you mess up, you can always reprint that page. Also note that one of the patterns is meant to be traced seven times. I may do it with just one print. But if you’re using typical thin printer paper, you might want to print out additional copies of that piece if the pattern starts getting worn. The scissors I’m using here are some lightweight Ginghers, which are my go to for cutting paper and patterns. Transferring the patterns. The first thing to do is to transfer your patterns to the leather. The hide that I am using is a high quality veg-tan leather that is about nine ounces thick. I positioned the pieces of this project at the upper back of the hide. If you’re just getting started, don’t worry too much about this. Just build the leather and go with what feels more firm. Every hide will be different, so try to avoid any gauges, blemishes, or spongy areas. I’m using a red fine point sharpie to trace the outlines. It’s good to use a fine point so you’re forced to follow tight lines with your cuts. Though you can use just about anything that won’t smear on the leather. I do trace an ink on the front and I don’t worry about the lines left behind from cutting because I bevel the edges at a later stage. I would like to advise that you do take your time at this stage and get good clean lines to follow. Separating the leather. Once the patterns are transferred to the leather, I like to separate the pieces into manageable chunks before cutting. Here I’m using an Al Stohlman knife for these cuts. Although I don’t know if this particular item is sold anymore. But there are many options. I have also often used a standard box cutter or utility knife. Cutting the leather. With these smaller sections, you can now more easily start the cutting process. My default method for cutting leather of mid to heavy thickness is leather shears. The shears I’m using here are a craft tool brand from Tandy. And these have been my go to for years. Now you do need sheers if you’re going to use any kind of scissors to cut this. Leather shears have a flat serrated edge on the lower blade that enables cutting into thick leather. It does require some hand strength and practice, so your mileage may vary. If you don’t have leather shears, there are kind of other ways to cut the leather. I’ll have to go over that in another video. I can give you a couple tips in the meanwhile though. If you are using a utility knife or box cutter, make sure you polish or strop your blade even if it’s a brand new one. Then it should glide much better through the leather. And of course, just take your time and be careful. Also, if you’re trying to cut with shears and it seems difficult, you can also wet the leather to make it easier. Transferring the designs. For my design for this helmet, you’ll need to transfer those lines now. If you want to make the design a little bit easier, you can omit this step and go with no trim or just a simple border. Start by dampening the leather slightly. Just a light mist along the edge should be fine. Give it just a bit to soak in so the pattern doesn’t get saturated with tracing. I’m using a fine ball point pen with no ink to trace over the lines. On some of the parts, I’m also just tracing the main protrusions. Like those little carves of the design. And then I’m gonna use a wing divider ensure a consistent band along the edge. And you may also seem to use dots to indicate the line instead of drawing over it. I’m also simply pressing a dot in the center of the pattern holes. But it will probably be easier in the long run if you trace out the entire hole or use a hole punch to gently transfer the hole marks through the pattern to the leather. On the face place piece to save a little time, I just flipped one side over and reused it to transfer the pattern onto the other side. Prep for carving and tooling. We’re almost ready to tool the border trim. In order to do that, we have to wet the leather. The moisture is what makes the leather fibers malleable. So the amount of saturation is important in the results of carving and tooling. And there a number of ways to do it. I normally go for a fast emersion with the leather, but it’s easy to get the leather too wet. So I’m demonstrating a method that is a little bit easier to control. I’m using a high density sponge to saturate the surface of the leather. Basically to the point to where the water pools on the surface and then moving on to the next piece to do the same. After I’ve given the pieces a few minutes to soak up the moisture, I’ll come back with a sponge and do a quick pass again to help normalize the surface moisture. Carving the leather. There are many methods you could use to decorate the project. For this demonstration, I’m using a swivel knife with a ceramic blade to make cuts into the leather. You don’t have to use a ceramic blade. It’s really to preference. The main thing is to always have a sharp blade that is strop. If you are unfamiliar with using a swivel knife, I highly recommend trying it out. Being able to put deep, smooth, and crisp lines into leather opens up a whole new arena of design and decoration options in leather. It may take some time to become proficient, but it’s worth it. A project like this with a lot of repetitions on the design lines is a great place to get that practice. So try out your techniques on some scrap before committing. As you work with the pieces, you’ll have to refresh the moisture from time to time. I usually try to spray any pieces that look like they’re getting too dry so they’re an ideal moisture level whenever I get to them. Edge beveling. Now we’ll talk about beveling the edges. This step is optional, but it is highly recommended. I bevel nearly every edge front and back of every piece and this does a few things. One, it makes the end result look cleaner and more professional. Two, it is necessary for getting a smooth burnished edge [inaudible 00:13:42]. And three, it makes the leather more comfortable to use and wear. There are a few instances where you wouldn’t want to bevel the edge, but those don’t really apply here. Here I’m using a number two Craftool pro edge beveler. And I’ve gone through buckets of edge bevelers over the years and these are my current favorites. They’re comfortable in the hand and they just glide through. They really seem to keep their edges well. One tip I have for making this process smoother is to bevel when your leather is just a little bit damp. You can do it dry and it’s fine. But if it’s a little damp, the beveling process also firms up the edge fibers so it’s easier to burnish later. But don’t bevel when it’s too wet or it’ll just dig in and cause problems. Punching holes. We’re now ready to punch the holes for the piece. There are a few ways to go about this. First, you can use a hole punch, use a certainly common option and readily available. Just be sure to preserve your tip and don’t drive it through the working surface. Here’ I’m showing you how you can use some scrap leather to avoid damaging the tip. And here I’m using a polyboard. And here I’m using a rubber mat. What I’ll be using for most of the holes is this rubbery hole punch. I think this one is a CS Osborne. This is my go to as long as it can reach. There are also times where you’ll have to drill a hole. Note that I am waiting to punch the holes on the side plate so it’ll attach the face plate. And I recommend you also wait so you can test the fit and see if you’re happy with the position. You can easily change it by modifying these holes. Now we get to the part where things get really creative. For this tutorial, I’m sticking with a very basic border tool and to accent the design lines. I’m using a general cross hatch beveling tool here. It’s a Craftool B205. But this is a great spot to just play with some alternatives too. Grab some scrap and just do some tests. And try out any tool that you think would go great along the border. Or even feel free to skip this step and stick to clean lines. Shaping the leather. Now we’ll do a bit of basic wet molding on the leather. There’s a lot of mistakes surrounding this technique, but it’s not scary. I’ll be showing a simple folding technique and doing a little hand shaping to give a little extra dimension to the pieces. This process is also optional. In the second variant, there’s little to no shaping and you may prefer a smoother look. When doing this fold method, the leather needs to be moderately damp especially along the fold. All there is to it is to fold the piece in half and then carefully hammer with a medium firmness on both sides of the ridge to compress the leather along the fold. The hammer face needs to be convex and polished to avoid hammer marks in your leather. When you unfold the pieces, there should be a subtle ridge left behind. From there, bend and form the pieces by hand slightly to bring them closer to the final shape. Something to keep in mind is that this process, as I’ve demonstrated here, will effectively shrink the helmet dimensions slightly. So this will, in fact, make the helmet fit a little bit tighter. Coloring the leather. For this project, I’m using red Eco-Flow Waterstain. I’ll be describing the methods I use to achieve the end results you’ve seen already. I knew I wouldn’t be doing a lot of tooling and other details. So I wanted to get some texture in the coloring. This is just one of many possible techniques. I encourage you to adjust the coloring process to your preferences. The first thing I did was to apply a generous coating in medium sized circles with a large wool dauber and leaving a lot of excess behind. Normally, this is the opposite of what you would do, but bear with me. I’m doing this so that there is a broad base texture. The next stage of the process is to add a finer texture after the first layer is dried completely. To achieve this, I simply grabbed a napkin, wadded it up in an [inaudible 00:29:52] way, and used it to apply a thick randomized texture. And here again, let it dry completely. The final stage of this coloring process is to apply the black trim. I’m using some black Fiebing’s Pro Dye for this as it will easily dominate any previous color. I’m using a small wool dauber to get a clean consistent border on the side an back edge. And filling in the rest with an angled brush. When you’re finished with the coloring process, let everything dry and give everything a quick buff using something like a cotton rag to remove any excess pigment. Surface finish. Now that your color work is done, you’ll normally want to seal the leather with a finish. The topic of leather finish is pretty deep so I’m gonna keep it simple and just talk about what I did for this project. I’ll save the rest for more specific videos later. I’m using Tandy satin shene for both variants of this project. For this primary variant, I’m coating both the sides front and back. I’m using a piece of high density sponge to apply the finish. The method I’m using here is to apply generous wet coating to all the pieces. And then while they’re still a bit damp, we’ll take the sponge. We’ll make sure it’s mostly depleted of the finish. And then I’ll use that slightly damp sponge to even out the finish. The second pass will give a cleaner look. If you prefer a more rugged look, you can stop at the first pass and scuff the finish when it is dry and using something like a Scotch-Brite Pad. Assembly. This is where things will finally start coming together. Figuratively and literally, I guess. I’m using your basic every day double capped rivets for this helmet.the recurring theme here is of course there are many possible methods. This is just one. I’ll be using medium and long versions of the gun metal rivets. Pick a helmet side and start with the front panel. The first and last rivets on each side will only go through two layers of leather. So you’ll use a medium length for that. And long for everything else. The method I’ll be using is the down and dirty get it done approach of hammering it flat. Normally I would use a setter and a [inaudible 00:37:02] or a dedicated rivet foot press. But I understand the overwhelming majority of people wanting to try this will not have those things. Anyone with a hammer and a hard surface can use this method. And as long as you get a good flush set, it will really never come apart. Line up the first rivets and hammer them straight down. If you do have a problem with the rivets setting properly, it is normally the angle of your strike. Hit straight down with a solid blow and it should be fine. If any rivets skew or set crooked, go ahead and pull them out with pliers or diagonal cutters. If they do set wrong, it’s usually pretty easy to get them off. Continue with the next seven layers in the same way. Take notice the last two bottom layers are slightly different from each other. When you’re finished assembling one side, grab the other side piece and begin the process again from the front. It will be slightly more challenging due to restricted space for hammering. And if you go layer by layer, you should have just enough room to get it done. And there it is. The helmet core is complete. Now the only thing left is to attach the face plate. Attaching the face plate. As mentioned previously, I withheld punching the holes of the side plates. This was so I could align it to my preferences. After settling on the final location, I mark the spot accordingly, which incidentally was virtually the same as the marks on the pattern. But it’s always good to check. For the bottom hole, I was able to use the rotary hand punch. For the top hole, I had to use a drill. After double checking the final fit, I placed a Chicago screw at each top point to make a pivot for the face plate. You can also use rivets here, but I prefer Chicago screws for any moving or low bearing parts. For the bottom holes, I’ll be using snaps. This is to allow the snaps to be undone to raise the face plate. And then to snap together to hold the face plate [inaudible 00:41:09] lower. To prep the leather for snaps, I normally flatten the spot a little bit. I’m using the smaller line 20 snaps for this so it helps to thin the leather a bit in this way. To set the snaps, I’m using a basic [inaudible 00:41:23] and a typical line 20 setter. I realize setting snaps is a tricky thing for a lot of newbies. But with a little bit of practice, you’ll get it. The main thing is just take your time. Make sure you have enough post length on the inside, but not too much either. If it’s too long, it’s easy to just bend the post over. If it’s too short, you want to get the post to grab the mating piece before it starts to curl. Just give it some general taps to get it started and then dry that down enough so that it is firmly set. The inside of your snaps should look like this when it’s set. And there it is. It’s all done. It does take a considerable amount of time to produce these videos. And I really want to improve the quality and quantity of the content I’m putting out. If you feel like you gained some knowledge from this or were entertained by watching, I hope you’ll consider supporting me in this journey. The easiest way to do that is to like, comment, subscribe, and share my content. That way our algorithm overlords will flag this as relevant and interesting content and boost the signal. If you made it this far into the video, thank you so much for coming along with me on this. If you like this project and want to craft this helmet, I will be making this pattern available for purchase. But for a limited time, I’m going to be giving this pattern away for free to anyone subbing to my channel. So check the description for details on that.